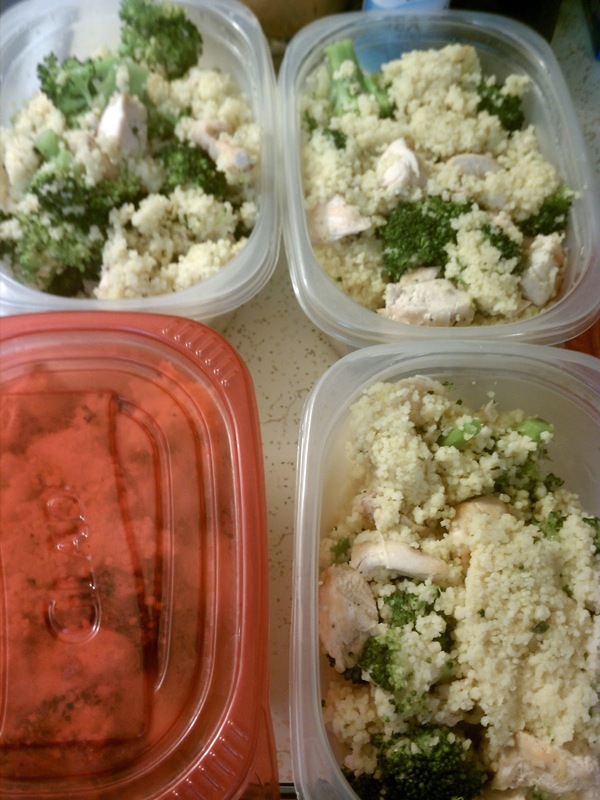 For my weekday lunches, I pre-make two different things, and rotate through them throughout the week. That might sound boring to some, but I like the ease of making them on the weekend, freezing some and refrigerating others, and being able to pull them out in the morning and be ready to go. So, here are a couple recipes that I use. This was adapted from a video recipe on the Runner's World's website, which I can't seem to find anymore. Chop one onion and sauté in a large pan on high heat until softened and beginning to brown. Add one 14.5 ounce can each of garbanzo beans (drained and rinsed), diced tomatoes and chicken broth, plus a large-ish diced tomato. 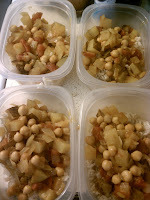 Season with curry and cayenne to taste. Cover, lower heat to low and cook until potatoes begin to soften, half an hour or so. Uncover and cook on medium heat until some liquid is reduced. Serve over rice. Freezes well. Microwave for a couple minutes and stir to serve. I believe this originally came from the South Beach Diet Cookbook; I've adapted it as well. I use boxed couscous from Near East; they have a bunch of different flavors. Following directions on the box, add water, seasoning and olive oil to large pot and bring to boil. Add broccoli and steam to desired doneness. Pour in couscous and stir until moistened. Add grilled chicken or stir-fried firm tofu, stir and let sit for at least five minutes. Can be eaten cold or reheated.